Facing decisions about health challenges can be difficult and daunting. “Do I have to go into a nursing home?” Can I stay at home safely? Who will be there for me? What should I do, I don’t want to be a burden to my children or spouse? But then who will make sure I have what I need? I don’t know if can deal with health care bureaucracy.” Covenant Home Health Agency LLC can be the answer to your fears. 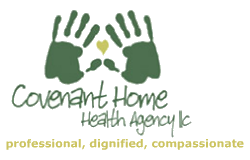 Covenant Home Health Agency LLC will be there for you. Our dedicated nurses, aides, and therapists will assure that you have the medications, supplies, and equipment you require. They will be your advocates in the health care system and above all make sure all your physical and emotional needs met with compassion, professionalism and dignity. Please contact us at: 614-522-0521 or Toll Free at 1-866-221-5251. We can help!